There was penalty heartbreak for Lancaster City as Chorley lifted the Lancashire FA Challenge Trophy on Monday night. Phil Brown’s underdogs, two leagues below the Magpies, had led twice before being pegged back as they game ended 2-2 in normal time at Bolton Wanderers’ Macron Stadium. The Blues’ tired legs showed in the shoot-out with Ricky Mercer, Craig Carney and Tom Kilifin all missing as Chorley prevailed 3-1 from the spot. Zach Clark had given the Blues the lead after just 90 seconds with Jake Cottrell levelling up eight minutes before the break. City were back in front almost immediately through Craig Carney’s volley with Darren Stephenson’s goal ultimately taking the game to penalties, the striker scoring 15 minutes from time after seeing his initial penalty saved. The Dolly Blues made a dream start and were in front after just two minutes on the biggest night in their recent history. Ricky Mercer rose highest to meet Ryan Winder’s corner and saw his effort saved by Sam Ashton but Zach Clark was on hand to do the rest from a yard out. As was to be expected Chorley then controlled long periods of possession with the Dolly Blues on the back foot and relying on sporadic counter attacks. It was a largely scrappy affair though and the National League North side only had half chances, Mercer denying James Dean a clear opening six yards out before Andy Teague headed harmlessly wide. City came close to doubling their advantage 10 minutes before the break but after finding room in the area Billy Akrigg could only curl his shot from 15 yards narrowly wide. Chorley were level two minutes later. Mike Hale could only punch a cross into the path of Kieran Charnock who saw his initial shot blocked with the ball falling to Cottrell who drilled home through a crowd of players from 15 yards. The Blues’ response was almost immediate however as they went in front for a second time 90 seconds later. 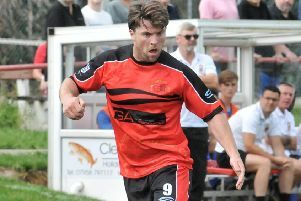 Goal scorer Clark turned provider as he laid Jacob Gregory’s cross into the path of Carney who volleyed home superbly from 20 yards. The Magpies had a big chance to level things up three minutes into the second half but after Dean had been played in behind by Jordan Connerton Hale rushed out to block his shot. As the game began to open up the Dolly Blues then had a golden opportunity of their own on the counter attack but Ryan Winder saw his effort come back off the bar when in on goal. Chorley were the next to go close with Adam Roscoe bringing a sharp save from Hale with a driven free-kick after Neil Marshall had been booked for a foul. City were a pass short of several glorious chances with three-on-two and four-on-two situations going to waste as they hit Chorley on the break at will. Zach Clark then saw a header well held by Ashton before Mike Hale repeated the trick at the other end, keeping out Darren Stephenson’s effort. It the Blues who continued to have the best of the chances with Billy Akrigg’s shot from Gregory’s cross hitting Ashton’s knee and going wide. Brown’s side were made to pay on 74 minutes with Chorley levelling things up for a second time from the spot. Mercer was penalised for handball as Connerton’s scuffed shot bounced up with Stephenson seeing a poor spot kick saved before firing home the rebound. Lancaster tired in the closing stages but neither side could find a winner with the game decided from the spot. It was Matt Jansen’s men who ultimately held their nerve as former City man Paul Jarvis scored the spot kick that saw Chorley lift the trophy for a 17th time. Chorley: Ashton, Ross, Charnock (Jarvis 61), Teague (capt), Roscoe, Lynch, Whitham, Cottrell, Dorney, Connerton, Dean (Stephenson 53). Subs not used: Correira, Bailey, Darr. Lancaster City: Hale, Henry (Davis 90), Marshall (capt), Mercer, Clark, Watson, Akrigg, Winder, Carney, Gregory (Kilifin 81), Clark (Cummings 85). Subs not used: Rodgerson, Carlton.